After sharing a number of bottles of wine, the Doyles, whose trip was booked last minute with no plans or knowledge of Paris, borrowed the Stanton’s Paris guidebook. Seamus asked that they post it back as he had many notes in it and Una Doyle quickly responded that she ‘Would NOT’, but the Stantons had to visit them in Belfast to collect it! Two years later the Stantons got off the Stranraer – Belfast ferry and a 26 year relationship began. Indeed, with the Stantons a generation older than the Doyles, they figuratively ‘adopted’ each other, and over the ensuring years, they all ‘crossed-the-pond’ in both directions numerous times, and the families had children, grand-children and great-grand children. Last year, Seamus, now in his 80’s, edicted that they had to all get together in Kenmare for a holiday, luckily Elizabeth agreed! At the start of July they all began arriving in Kenmare, from North Carolina, Florida, New York, New Jersey, Manchester UK, and Belfast, in total 20 members of the combined clans! Sadly, schedules allowed them only two full days as ‘One’ but a brilliant two days it was, with a grand celebration dinner taking place at Sheen Falls Lodge on July 16th. Good craic would an understatement, and fortunately for the other lodge guests, the door to the Drawing room could be closed! 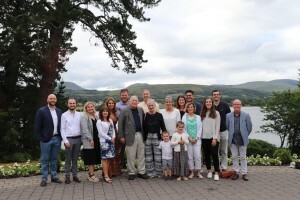 In addition to their enduring and wonderful friendship, the gathering of the clans had much to celebrate including Jamie Quigley’s birthday, Dr. Stephen’s graduation from Medical School and the 60th wedding anniversary of Elizabeth and Seamus. Seamus’s grandparents came from Cork but he just loves Kerry, and Kenmare has a special place in his heart, as it does in the hearts of every member of the cross Atlantic family who have vowed to return!